8. COAS Bajwa’s call for "Open Debate on CPEC"
Pakistan’s Supreme Court disqualifying Mr. Nawaz Sharif for being ‘not honest’ under Article 62(1)(f) of the Constitution has raised myriad questions and concerns that require Pakistan’s polity to immediately and thoroughly address. 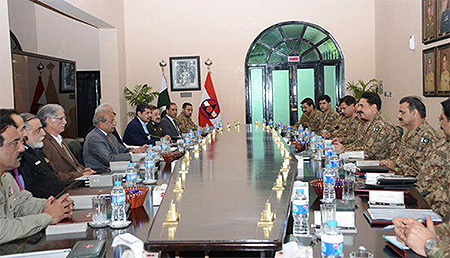 A special meeting of the Apex Committee Sindh took place on July 04, 2017 at the Headquarters of Karachi Corps, which was attended by Chief Minister Sindh Mr. Murad Ali Shah, MPA alongside the Chief of Army Staff General Qamar Jawed Bajwa and other members of the committee. 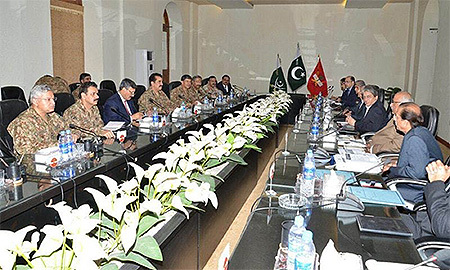 The picture released depicts a seating arrangement of the Apex Committee meeting with COAS at the head of the table normally assumed by the person presiding over the meeting. Apparently this is a departure from the past practice in which the Chief Minister – the civilian-elected chief executive of the province – and the Army Chief sit on opposites side of the table, facing each other. Whether these optics are an isolated incident or represent a substantive shift in the position of the military is hard to tell. 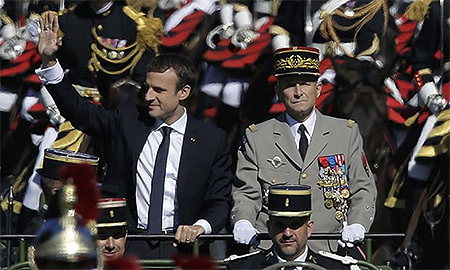 However, the optics must follow the constitutional position that role of the Military is to work in aid of civil power. Reportedly, the constitution of Apex Committees after the National Action Plan came about as a way to improve coordination between the Provincial Governments and the Law Enforcement Agencies. However, their constitution has apparently taken place without any formal official notifications. The desired coordination can best take place when the civilian elected governments are fully in charge and seen to be so. On their part, the Provincial Assemblies need to exercise oversight on the role of these Apex Committees. 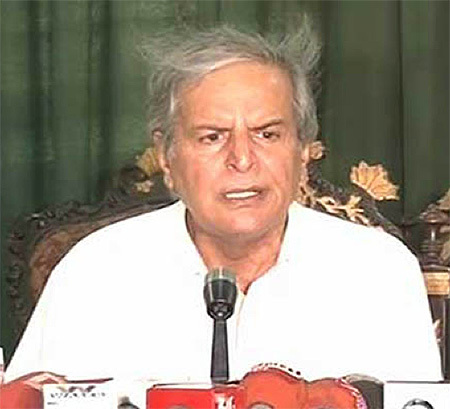 Mr. Hashmi expressed his exasperation at the lack of accountability of former military generals who had violated the constitution. He was also critical of the Supreme Court’s history as according to him ‘it did nothing when the Constitution was trampled in the past‘  while referring to its role in legitimizing military coups. On July 07, 2017, a month after the latest National Security Committee meeting, Prime Minister Nawaz Sharif chaired the 9th meeting of the National Security Committee since its formation in 2013. It is a welcome development that the National Security Committee is meeting more regularly since May 2017 maintaining a monthly periodicity. 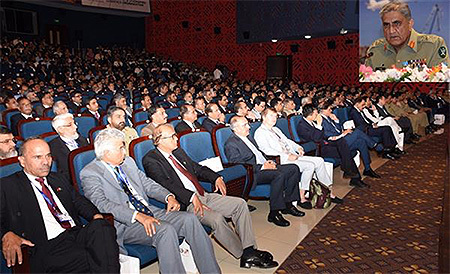 With many All Party Conferences held on the project that have also resulted in formation of a Special Parliamentary Committee on CPEC in September 2015  as well as an 11-member Steering Committee including 4 Chief Ministers , the project has, indeed, continued to see very vibrant and open debate on the issue across all stakeholders belonging to different political and geographical perspectives since 2015. In addition, the project also receives probing print and electronic media analyses, as should be the case in a vibrant democracy. Given that the COAS has given the call for open debate on CPEC at this stage seems to suggest to national and international audience as if Pakistan has signed on the project without required internal debate. If this is not the intent of his comment, it must be clarified. As a developing country home to the world’s 6th largest population, Pakistan does not have a shortage of challenges in nearly every sphere. One can hardly argue that the “Us & Them” narrative depicting multiple power centres within the country is helpful in addressing these challenges. Instead of promotion and strengthening of a dangerous perception that Pakistan’s institutions are at loggerheads with each other, there is no more critical time than today that institutions come forward and urgently address this critical challenge. The ISPR in its press releases off late has been using the incorrect spellings of Balochistan. Given that Article 1 of the Constitution  was specifically amended under 18th Amendment to the Constitution to change the spellings of the name of the province from “Baluchistan” to “Balochistan,” the official public relations body representing the 3 branches of the Pakistan Military would do well to use correct and official spellings of the province. 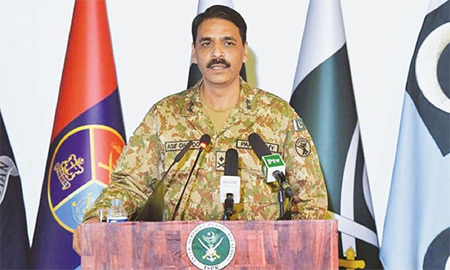 Previously, at an in-camera briefing session to the Senate Standing Committee on Foreign Affairs on June 21, 2017, Mr. Aziz had reportedly shared that Gen. (Retd.) Raheel Sharif cannot be called back to Pakistan because he had joined the Islamic Military Coalition to Fight Terrorism in his personal capacity. These remarks indicate at the very least the existence of some form of confusion within the Government on the role of Gen. Retd. Sharif in the IMCFT. Leisure League is considered to be the largest international organizer of football events and it has recently expanded its activities in Pakistan. Reportedly, the Punjab Government was first asked by Leisure League to provide security for the event, but it refused in the light of precarious security concerns. 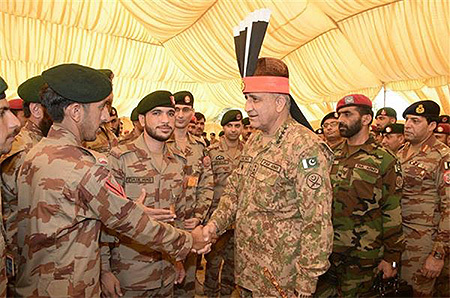 Afterwards, the Pakistan Army was contacted to provide security for the event. The then Prime Minister Nawaz Sharif and Chief of Army Staff Qamar Jawed Bajwa met once during the month and that too during the National Security Committee meeting on July 07, 2017. PILDAT organized and conducted a Study Visit to Indonesia from July 17-20, 2017. As Pakistan and Indonesia share many common traits, including the journey towards democratic consolidation from military rule, the purpose of the study visit was to seek a deeper understanding of democratic consolidation in Indonesia just as Pakistan has begun its own longest uninterrupted spell of democratic governance in 2017. The Pakistan delegation was led by Senator Mushahid Hussain Sayed, Chairperson, Senate Standing Committee on Defence, while the members included Syed Naveed Qamar, MNA Chairperson, National Assembly Standing Committee on Railways and former Defence Minister; Senator Muhammad Javed Abbasi, Chairperson, Senate Standing Committee on Law and Justice; Oversight Committee on Eradication of Corruption from Federal Government Departments; Senator Lt. Gen. (Retd.) Abdul Qayyum, Chairperson, Senate Standing Committee on Defence Production; Lt. Gen. (Retd.) Moinuddin Haider, Former Federal Minister for Interior; Former Governor Sindh Province; Syed Ali Zafar, Senior Advocate Supreme Court of Pakistan; Former President Supreme Court Bar Association; Ms. Aasiya Riaz, Joint Director PILDAT and Ms. Amna Kausar, Projects Manager PILDAT. In a multi-dimensional study visit, the delegates engaged in a variety of discussions, interactions and exchange of views in Indonesia. The delegation received interactive briefings on the state of democratic consolidation of Indonesia by Mr. Jakob Tobing, one of the most prominent architects of the new democratic Indonesia who played an instrumental role in Indonesia’s transition from the authoritarian rule to democracy in 1998; Dr. Ali Wibisono, Faculty of University of Indonesia and Mr. Meidyatama (Demas), President of the Antara News Agency, while in Jakarta. Pakistan delegation also visited the Centre for Strategic Studies and International Studies (CSIS) where Mr. Jusuf Wanandi, Vice Chair CSIS and CSIS experts gave an insightful presentation on Indonesian journey towards democratic consolidation. The delegation also visited the Habibie Centre, a leading think tank that works on democracy and human rights in Indonesia, where it received a briefing on state of democracy in Indonesia. In addition to interactive sessions, the Pakistan delegation also interacted with Indonesian Government representatives and opposition leaders. The Pakistan delegation called on the Defence Minister of Indonesia, Gen. (Retd.) Ryamizard Ryacudu who discussed with the delegates Indonesia’s policies to combat terrorism. In a conversation with Dr. Fadhli Zon, Vice Speaker of the House of Representatives (Indonesian Parliament), the Pakistan delegates were briefed on key features of the Parliament, election process and constituency politics in Indonesia. General (Retd.) Wiranto , Coordinating Minister for Political, Legal and Security Affairs, briefed the Pakistan delegation on functions of the Coordinating Ministry especially in coordination and synchronization of the formulation, determination and implementation of policies related to issues of politics, law and security in Indonesia. Pakistan delegation on Study Visit to Indonesia also called on the Honourable Vice President of Indonesia, H.E Mr. Muhammad Jusuf Kalla at the Merdeka Palace, Jakarta. The Honourable Vice President highlighted the strengths of relations between Indonesia and Pakistan and the role the two countries can play in addressing challenges faced by the Muslim Countries. In a grand finale to the Study Visit, Pakistan delegation was warmly received with a Guard of Honour and band playing national anthems of Indonesia and Pakistan at the Gerindra party headquarters by the chairman Gerindra Party Mr. Prabowo Subianto alongside his party office bearers. A full report on the Study Visit is under preparation and will be released soon by PILDAT. Ahead of PILDAT Study Visit to Indonesia, PILDAT commissioned a paper to reflect latest developments in the context of civil-military relations in Indonesia. Authored by Dr. Ali Abdullah Wibisono, the paper carries a most recent account of development of Civil-Military Relations in Indonesia. 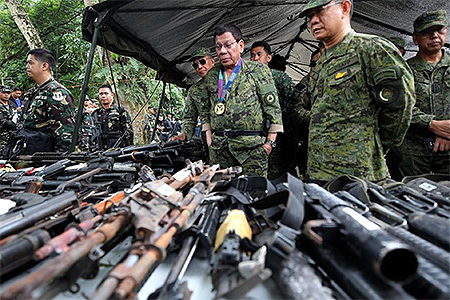 The Philippine Congress extended the martial law imposed by the President of Philippines, Mr. Rodrigo Duterte, on May 23, 2017 in the island of Mindano on July 22, 2017 for five more months. In the absence of extension by the Congress, Mr. Duterte’s proclamation of martial law was going to expire on the evening of July 22, 2017. According to a survey conducted by Suan Dunsit Poll that was released on July 15, 2017, more than 70% of the Thai respondents believed that even after three years of attempting to build unity in Thailand, the military-installed regime has failed to bring about reconciliation. ‘Disharmony in politics’ was the top-most concern of the 1278 people interviewed for the survey, followed by ‘behaviour of politicians’. Two-thirds of the people believed that politicians often abused their power for their own benefit and set a bad example due to their verbal abuse. 57% people were also afraid that the election would be further postponed. Under 18th Amendment, Article 1 of the Constitution was amended as follows: In the Constitution of the Islamic Republic of Pakistan, hereinafter referred to as the Constitution, in Article 1, in clause (2), in paragraph (a), for the word ‘Baluchistan’ the word ”Balochistan”, for the words ”North West Frontier” the words ”Khyber Pakhtunkhwa”, and for the word ”Sind” the word ”Sindh” shall be substituted . In 2014 General Prayut Chan-o-cha, Commander of the Royal Thai Army, launched a coup d’état disposing the caretaker government after six months of street protests against it. The military then set up a National Council for Peace and Order (commonly known as Thai Junta) to govern the nation. The Senate and Parliament were dissolved and the constitution repealed. The NCPO then issued an interim constitution, and established a military dominated national legislature, which unanimously elected General Prayut as the Prime Minister.